With a base price below $13,000, the 2018 Nissan Versa is an affordable, comfortable and economical subcompact sedan with a roomy interior, large trunk and popular features. It's also the least expensive new car available in the United States, undercutting competitors Hyundai Accent, Kia Rio, Toyota Yaris iA, Chevy Sonic, Ford Fiesta and Mitsubishi Mirage. A 5-speed manual transmission is standard, but an automatic is available. Nissan versa only two complaints. I really do love the 2018 Nissan versa the only thing I do not like about it is that everything is manual. I have this weird thing with my blinkers that every once in awhile the randomly just come on for no reason without me even turning them on. It has great visibility it is very spacious for the size of the trunk is humongous. Every once awhile I do have a problem with the seats locking into place when I want them to. But really overall it is an excellent car it drives nice the brakes are great no weird noises and it notifies me when tire pressure is low or I need an oil change. I love my Nissan versa glad I made this purchase. My Nissan versa is very good on gas. I change my oil every 3000 miles so I haven't had any problems out of it at all. It is a small car, only 5 passengers. 2 in front and 3 in back. It is a economy car my insurance is not very high on the car. It is black so it is kind of hard to keep clean. The only problem I have with the car is every time I get out of the car whether I want them to or not my doors lock. I do not like that I have nearly locked my keys in there several times. Overall it is one of the best cars I have ever owned. I definitely would recommend it. The one thing people should know about this vehicle is that it's luxury quality at an affordable price. I bought this car because I was immediately attracted to the body style. I'll have to admit, I knew I wanted it before the test drive. It has an amazing high quality interior that I fell in love with, after just seeing it once. It drives so smoothly and it's so quiet. It has more than enough space for what I need and I wouldn't be this happy with any other vehicle. There's absolutely nothing I dislike about this vehicle and believe it or not, I have zero complaints. The Worst Car Ever Made? 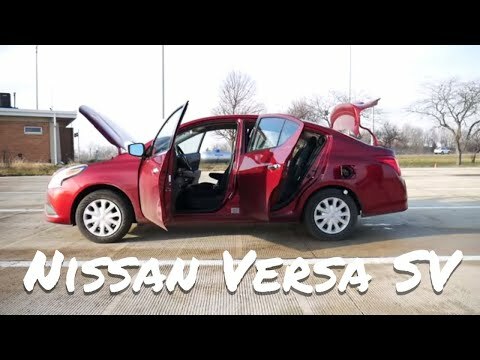 Lets Review The 2018 Nissan Versa! Nissan North America, Inc. (Nissan) is recalling certain 2017 Nissan NV200, Sentra, NV3500 Van, NV3500 Bus, NV200 Taxi, NV1500, NV2500 Van, Chevrolet City Express, 2017-2018 Frontier, Versa Note, and Versa Sedan vehicles that have a mechanical (physical) key ignition system. In these models, over time, the weight on the key ring and road conditions or some other jarring event may cause the ignition switch to move out of the run position to the accessory position, turning off the engine. If the vehicle stalls, it can increase the risk of a crash. Nissan will notify owners, and dealers will inspect the production information on the ignition switch, and replace it as necessary, free of charge. The recall began October 1, 2018. Owners may contact Nissan customer service at 1-800-867-7669. Nissan North America, Inc. (Nissan) is recalling certain 2018 Nissan Versa Note vehicles. During deployment of the side curtain air bag, a component of the air bag inflator may detach. As such, these vehicles fail to comply with the requirements of Federal Motor Vehicle Safety Standards (FMVSS) number 214, "Side Impact Protection," and 226, "Ejection Mitigation." If the component detaches during deployment, it may enter the passenger compartment and be a projectile within the vehicle cabin, increasing the risk of injury. Nissan will notify owners, and dealers will replace the side curtain air bags, free of charge. The recall began February 13, 2018. Owners may contact Nissan customer service at 1-800-647-7261.